AlMasdarNews reports: The Syrian Arab Army’s 67th Brigade of the 11th Tank Division renewed their offensive in the east Homs countryside today after taking a week-long hiatus to regroup before storming the strategic Al-Sha’er Gas Fields. Backed by the National Defense Forces (NDF) and 3rd Armored Division, the 67th Brigade stormed the Islamic State’s defenses outside the Al-Sha’er Gas Fields, targeting the hilltops overlooking this site from its southwestern perimeter. Following a series of intense clashes with the Islamic State militants, the Syrian Arab Army’s 67th Brigade and their allies managed to reach the entrance of the Al-Sha’er Gas Fields, marking the first time since they lost this site in July that they have reached its gates. 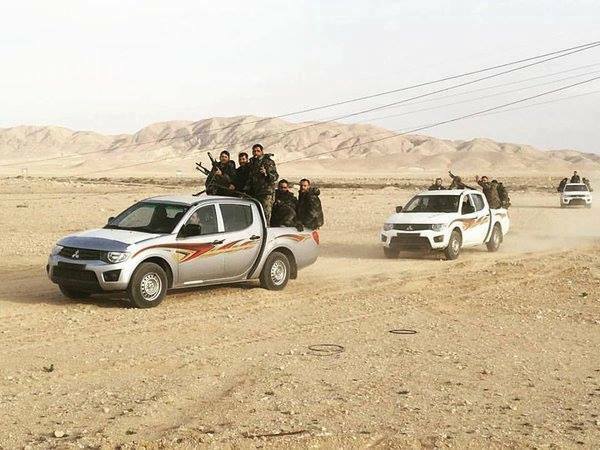 Fierce clashes are still ongoing at the moment; however, preliminary reports from the 11th Tank Division indicate that the Syrian Armed Forces are steadily advancing at the Al-Sha’er Gas Fields.